Master Smith began his Soo Bahk Do training in February 1990 in Royal Oak, Michigan under Master Wilton Bennett. Exactly one year later he moved to Vancouver, WA and had the good fortune of being able to immediately continue his training with Master Robert M. Shipley III who had opened his Camas Karate studio only a few months earlier. Mr. Smith was not through moving after his first arrival to Vancouver. Again, he was fortunate to find a Federation studio in Seattle from 1993 to 1995 and trained with Kyo Sa Jason Coleman. He trains and teaches at both Camas Soo Bahk Do & Oregon Moo Duk Kwan (Lake Oswego, OR). The consistency of standardized basic instruction emphasized in the United States Soo Bahk Do Moo Duk Kwan Federation has been a valuable benefit for Mr. Smith. 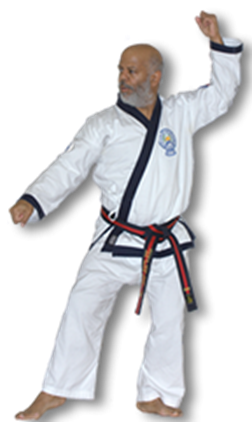 In January 2005, he successfully completed his 4th Dan & Certified Master Instructor (Sa Bom) evaluation at the 2005 Ko Dan Ja Shim Sa in Ramona, California. In March 2011, he was promoted to O Dan after successful completion of the 2010 Ko Dan Ja Shim Sa in Ramona, California. At Camas Soo Bahk Do, Master Smith volunteers his talents as an instructor which includes teaching classes, assisting with administrative tasks, and coordinating demonstration teams. Master Smith has been a member of the Region X Dan sparring and forms teams, representing the region at the 1996 National tournament. He is the past President of the Region 10 Dan Association, editor of the Region 10 Newsletter and Secretary of the Region 10 Dan Association. He has also served as local chairperson for the President’s Vision Tour Committee, represented Region 10 as a Board of Director member and served as the National BOD chairperson from 2008-2010. In January 2015 Master Smith shared his passion and dedication for Soo Bahk Do by branching out to launch Portland Soo Bahk Do at the Portland Trail Blazers Boys and Girls Club. Master Smith is employed as the program director at The Black Parent Initiative in Portland OR. He also does consulting and training in the area social service delivery and management, and Motivational Interviewing. He often visits other Federation studios while traveling in Washington, Oregon, and Idaho. During his “free” time Master Smith enjoys spending time with his wife – Sheila – and playing with his children – Robbie, Sarah & Raymond, listening to jazz and blues, and writing songs about vegetables (and other moving topics).